Jennifer Cluff: Do I need a new flute? Or is my old one broken? Do I need a new flute? Or is my old one broken? Quite a few "I want to buy a new flute" questions came in over the winter holidays, and I thought it would be helpful if folk knew how to test their flutes to see if they need repair. Also see Flute Care for more tips on annual flute repair and why it's normal. Sometimes your old flute is just fine, but you have forgotten that it has a maintainance schedule that's annual. This is a very common reason for flute students thinking that they need a new and better flute. But it's a normal repair-requirement that can be quickly remedied. Firstly, simply ask your flute teacher to test your flute for you. If you don't have a teacher, for gosh sakes go for at least one proper lesson to find out what's going on with your flute. When the flute teacher tests your flute, you will be able to see and hear for yourself what the flute's current condition truly is, and get corroboration on your own observations. This morning I quickly created the two quick diagrams above, one of the headjoint, and one of the body, (click on them to make them bigger, then use the back button) so that online flute students and novices could see the basic functions of flute repair and maintenance. It's surprising how few flute-shoppers are informed of these little details. Should help enormously! And once you get an idea about the mechanics of the flute, then you can re-consider the size of your bank-account, and possibly circumvent that emotionally desperate consumer-purchase feeling, and instead, get a repair on your current flute. By all means, have your teacher test the repair, and then start to save up for a well-informed flute purchase in the future. Best advice: take that money that's burning a hole in your hobby-budget, and spend it on your annual flute repair visit first. And by all means invest in one or more flute lessons so that someone who knows how to play-test flutes can be your personal expert. You can even audio-record the sound samples of the flute or flutes being tested by the teacher. Not only is the flute worth MORE after repair, but you can't put a price on the reduced practicing frustration; it is indeed PRICELESS! I'm looking into buying a new flute once I have more money saved up ( I'm a starving college student, of course.) Another flute major at my school suggested I find a solid metal flute, whether it's silver or gold (although silver is definitely more likely in my case). I guess pure isn't the right way to say it. I mean non-plated metal. Are there any benefits to this? Or is there any difference between having a sterling silver flute with a plated key system? I could post about all these extra mechanisms and stuff, but I think I'll ask later on in my shopping process. Basically, you decide your budget, and then look at reputable brand names within your price bracket with the help of your flute teacher. Buying without the help of an expert is fraught with possible purchase errors. Plated silver keys on a solid silver body are just fine (and I enjoy their lighter weight) if well-manufactured. The only drawback would be if a very dent-causing accident required soldering. Plated keys are cosmetically damageable during large dent-related accidents. Solid silver keys do not affect the sound or action of the flute; but do cost more, and are likely to be found on the more carefully made, more expensive flutes. Other options (such as offset G and inline G, b-foot, etc.) are topics you can ask your teacher about or read about online. Most flute specialty companies have a glossary of terms that you can look over to learn about all the myriad options. But try before you buy. many different brands is the key to the whole shopping process. And it's always best to buy a flute with the help of an expert flute teacher. Buying a flute without having it fully play-tested by someone who can stretch it to its limits is a very dicey business. The teacher will know immediately whether the flute is functional, flexible in tone, and responds well, or whether it needs repair prior to being properly play-tested. who's trying to work with a teeny tiny budget. Let's say the novice flutist has $400 and realizes after looking around on the net that they need $1000 to buy a decent "step up"
flute, or maybe even $2000. But $400 is all they have and they are truly motivated to improve their flute situation. Still have: $350-375 in savings. 2. Get advice from a flute teacher in person - Flute lessons start at around $25 for a half hour; take both flutes (rental and your own) to a flute lesson and get some basic playing advice. If you enjoy it, sign up for some more lessons. The new teacher can help you buy a quality flute. Cost: $25 to $100. Still have $300 or so in savings. 3. Repair your old flute - At your flute lesson(s), inquire about any quality used flutes for sale, and the name and location of the best flute technician in town (the one the flute teacher recommends highly) and take your old flute to the shop for repair. Your old flute will sell at a higher price if it's in good condition and recently repaired. Still have $100-150 or so in savings. 4. Use old flute to help buy new one - You can always sell your own instrument after selecting the best new instrument (or previously owned flute) that you can find. And that will replenish your bank-account. Your old flute will sell for more, because in good condition, and your flute lessons will have helped you select a good quality flute that's suited to your new and improved flute skills. Selling your old but completely refurbished flute and earn back repair bills of over-$200 in the future. Savings would then be back up to $200 plus whatever you have left over from renting a flute and some flute lessons. You may even recoup half your costs. Problem: You started with $400. And of course, now only have zero to a future $200, because of the cost of flute lessons and flute repair bills. But you now know exactly what was wrong with your own flute, and what it feels like to play on a better quality flute. You can put the $200 toward a payment plan for a new flute (with parental help), and/or can continue to play your newly repaired old flute diligently until you've saved up more. This seems like a sensible plan to me. And it shows parents that you're seriously invested in not just owning a "new toy" but having taken on the hobby of flute playing in a serious way. That really helps when birthdays and Christmas come, and you are asking for them to help pay for lessons and/or a month-to-month rental flute. I am a big proponent of improving good start up or intermediate level flute with a better quality head joint, assuming that the old flute has a good mechanism and pads that are seating...a big assumption in most cases! The used market for headjoints is very large and there are outstanding buy available, either at specialty flute stores or on-line. A solid silver custom made headjoint that cost from $900 to 1400 new can usually gotten used for $500-600. You can even find atop level, solid silver Yamaha AC or EC cut headjoint used for $350-400. Putting my professional level Sankyo head on a bottom of the line student level Pearl back up flute makes it play (in terms of sound and response) more like a $2500 instrument. I guess the big problem is deciding what kind your want and then finding someone who will let you try the used headjoint. Shipping a headjoint back and forth is very inexpensive. Of course, the headjoint has to fit but most high end makers make heads in .016 mm which can be fit well on a student flute, though a .014 head is likely to need too much fitting and cost to test it out. Thank you so much for yet another wonderful post! I knew my flute checkup was coming up in another few months, but I hadn't planned to bring it in until it was time. I had been experiencing problems, though, weird, intermittent problems that I couldn't quite nail down. Reading your advice, I decided to bring it in early. Turns out, it had some leaky pads and a loose rod (likely due to a fall from its stand a few months ago) that I hadn't at all suspected but the technician spotted right away. Thanks for writing Dalaire. Sounds exactly right; glad to help. I have just bought a new flute, but it seems odd that everytime I put it to my lips to play it moves slightly. When I hold the flute it seems that the headjoint moves side ways, but it is actually quite tightly fitted it moves when I put it to my mouth to play or wriggle it with my hand. Do you know what's wrong with my flute? I hope my explanation makes sense. That is a new one! 1. 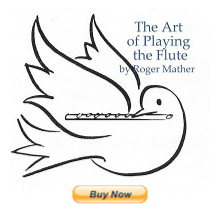 Have a professional flutist or teacher play-test the flute for you. They will notice if anything unusual is going on with the flute. 2. Have a professional flute technician (someone who specializes in repairing flutes) check the flute over to figure out if anything unusual is going on. a) look in the mirror to see if you can SEE what is happening. b) use a video recorder to record yourself and watch the video to see if you can see what is going on. c) take the flute to the store you bought it at (or send it back to the store you purchased it from) and ask them to check it over. I've actually never heard of a "moving lip-plate", so I'm guessing that something else is moving when you play. Maybe you can capture this on film. HI. I am a high school student who has a flute that is just so embarrassing to take out without having people asking what happened to it. It's a metal plated flute that I have had for 3-4 years and it is falling apart. None of my lower notes are capable of playing. There are rust dots that are coming from the inside out on the headjoint. Is it time for me to get a new flute?